The New York Times reports on Apple CEO Tim Cook's presence at the annual Allen & Co. media conference in Sun Valley, Idaho, noting that he is easily earning the title of "Mr. Popular" due to Apple's rare presence at the event. The conference, full of media bigwigs, has also been buzzing about any blueprints Mr. Cook may be hiding in Apple’s magic hat. He has lined up several one-on-one meetings with media executives here, fueling speculation that he is busy cobbling together partnerships for a home entertainment expansion. Cook has been keeping a relatively low profile at the conference so far, but he did note that he was "looking forward" to those meetings. When asked what he was looking forward to at the conference, Mr. Cook smiled. “I’m looking forward to all the private discussions I’ve set up this week,” he said. Would he have time for coffee with DealBook? You'd think multimillionaires could find clothes that fit better. Funny, i'm not a millionaire and i can do this. we don't want TV packages, we want TV shows. I don't want a package of networks bundled together. I don't want a package of all the shows from a single network. I want to pick and choose which shows I get. TV is different from music. Apart from a few select classic shows, I only ever watch each episode only once. I don't want to buy TV shows, I don't want to rent TV shows. I only want to pay a low cost for each season of a TV series. If the cost of watching eight shows is twice the price of getting cable or satellite, I'm not going to use iTunes, it doesn't make any sense. And don't forget those of us with stupidly low download monthly caps. How low, you ask? Try 30GB per month. So we also need an option for SD content. And last, don't make us Canadians wait months or years to get the same thing as the people in the USA. It's 99% the same shows. It's cute that he wears a name-tag. I have the same shoes as Tim! Why are you holding your shoe over your MacBook Pro? 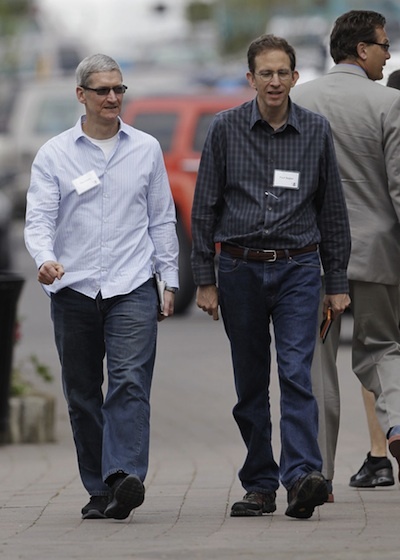 Tim Cook could have said, "I really hate going to these conferences, but the board makes me. I dread meeting with media executives -- they are such bores and tightwads." Now, that would have been really newsworthy! I wear one and I work from home.